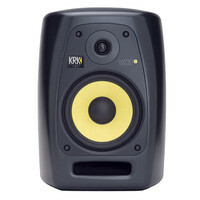 The KRK VXT8 draws upon the design characteristics of the Expose E8B. With a visually striking enclosure design that is equally functional providing low resonance improved structural integrity and extended low-end slotted ports for reduced port turbulence plus a sleek curvature that provides excellent imaging characteristics and a wider sweet spot the VXT monitors achieve a new level of precision.. This entry was posted in KRK and tagged Recording-and-Computers. Bookmark the permalink.